We spent last night in a truly unique place. Deming, NM at about 5,200'. collected rocks. This time we made the extra drive north. It is a quiet lonely place this time of year which adds to its charm. make for excellent night time star gazing. Our site was named Cassiopeia. Last night I gazed over head and there was Cassiopeia looking down on us. This morning we headed out on the final push west towards Phoenix. The campsites are well spread out and tucked into the formations. This rock looks like a geode that has been sawed open. It was a quick visit here. We'll be back for sure. Lake Pleasant Regional Park in the Northwest Phoenix area. It is another great park - part of the Maricopa County Park System. for storage of the Monty etc. It's going to be a busy couple of days. great speed it's going to be an excellent location to get caught up. Just a quick post tonight to catch you up. and now are in the West Texas City of Midland. Midland is famous as the home of George W. Bush. here as an overnighter on our dash west. Before Getting here however we first had to leave Asheville NC. While in Asheville I roasted some coffee beans as our supply was running low. The tailgate of the truck works just fine in a pinch. was a real bonus. It would have been nice to spend more time here but we are on a roll. Another 400 miles yesterday put us in Texarkana, Tx. We stayed at a very nice RV Park. The Shady Pines RV park. Nice, clean park and only $23 a night. It was a very rainy night but we had the fireplace going and we were warm and snug. Finally today we did another 500 miles and landed here in Midland. Our site (parking spot) here in Midland. City of Rocks State Park in NM. it out so this will give me a taste for future reference. to Lake Pleasant Regional Park in the Northwest Phoenix Metro. 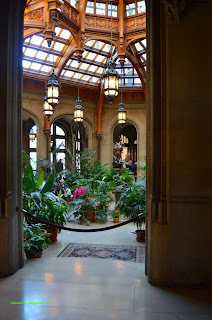 While in Asheville one must see attraction is the Biltmore. Built by George Vanderbilt II between 1889 and 1895 it is the largest private home in the US. remaining examples of a home from the Gilded age. Inside the main entry is the atrium. The main dining room just off the atrium. The atrium is just outside the archways on the left. Great Smoky Mountains providing a beautiful background. self sustaining forests. The Biltmore was one of the first of its kind in that regard. unturned. There is much more to see, but there was smoked pork calling us. We went for an early dinner at the 12 Bones Smokehouse. So special as a matter of fact that we went again yesterday for an encore. The 12 Bones Smokehouse is the place. Plus - we'll see them again in a couple of months out in Quartzsite. Tonight I write this blog from Western Tennessee in Natchez Trace State Park. For the last 3 days we've traveled about 270 miles down the Blue Ridge Parkway. Starting in Virginia we climbed into the 2000' range. and monday morning we saw our first frost of the season. altitude was in the 3,000' range. The colors picked in intensity. We started to see more reds and oranges. and we are limited as to where we can park two 55' long rigs. A bit of yesterdays color. to the 4,000 and eventual 5,000' sections of the Blue Ridge. one of the overlooks that we were able to fit into. There are hundreds of spots to stop and take in the view or picnic. Its engineered to take maximum advantage of the views along the way. When the government built this road they got it right. We are now in Asheville, NC and have finished our tour of the BRP. 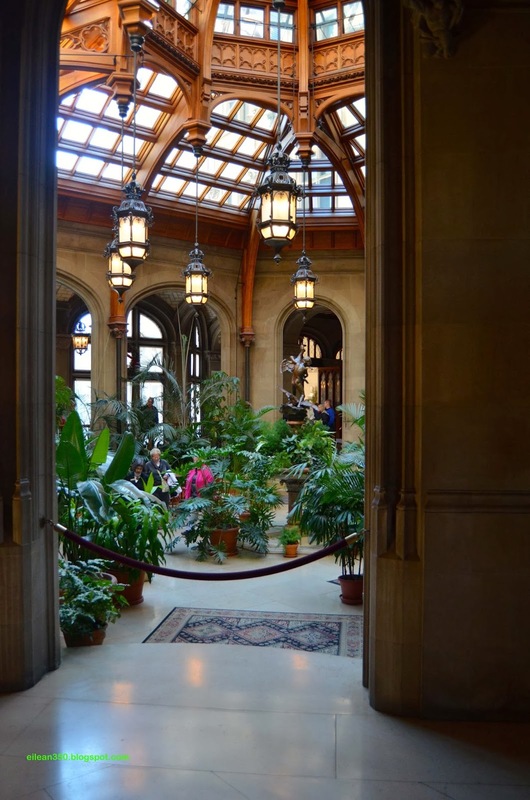 Next: We visit the Biltmore Estate. Ah the colors of fall. Today they arrived with a vengence. We left Appomattox around 1030 with only a 3 hr drive ahead of us. of the coastal plain and slowly onto the Blue Ridge Parkway. maximum advantage of the views. Another stop further down the road. With a 45 mile speed limit it lends itself for a leisurely ride. Along the way the colors provided a visual feast. Jim & Kristi check out the blacksmith shop. After we settled into our camp for the night we explored the nearby "town"
Being Sunday and in prime leaf season the place was hopping. A bunch of antique cars were out for the day. As I write this blog, the sun has set and we are sitting by the fire. The crisp air promises frost on the pumpkin tonight. Cocktail hour and a warm fire. The simple delights of life on the road. Today we toured the National Historical Park at Appomattox. and the final surrender took place. his starving Army and then head south into NC to join up with other forces. captured or destroyed the supplies before the rebels could be resupplied. death and destruction. Lee refused but requested to know what the terms might be if he did. 3 trains filled with supplies awaited his starving army. The Richmond Lynchburg Stage Road. captured and burned by General George Armstrong Custer. letter to Grant that he would like to meet to discuss the surrender terms. Lee sat at the marble desk on the left and Grant at the wooden table on the right. 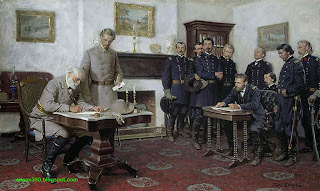 Here is a painting of the surrender. Custer is on the back left. This is a view of the outside of the house. 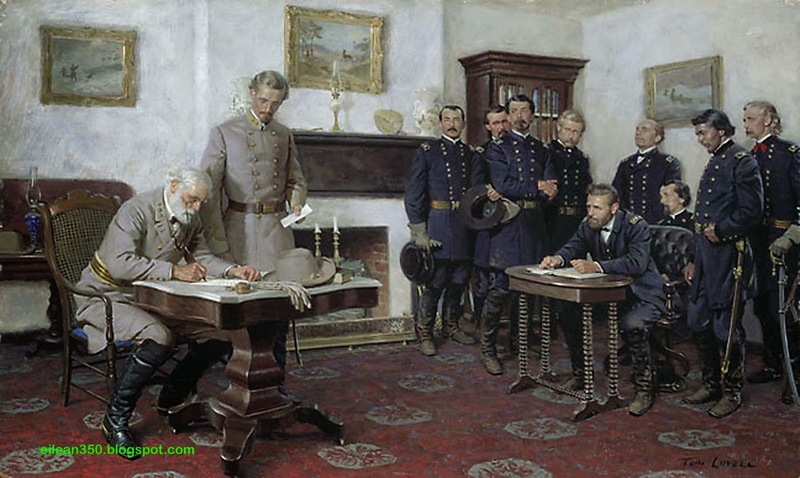 US Grant was wise and magnanimous in his surrender terms. and not wage war against the US any longer. He said this was a time for kindness, compassion, and reunification. in many other acts of compassion rather than rubbing their noses in their defeat. wounds caused by 4 long years of Civil War. surrendered soldiers and should be allowed free and safe passage home. and printed almost 40,000 passes in two days. offered in doing for doing so, each of them followed Lees lead. And just like that the war was over. our third President, Thomas Jefferson. fast stop to see him and Gracies' littermate and sister - Lilly. Thomas Jefferson was a complex individual. Declaration of Independence and was also quite an inventor. No photographs were allowed inside the main living areas of the home. 400 slaves. They were freed by his daughter after his death. His grave (the obelisk) and those of his direct decendants. a short distance from Monticello. The visitor center was quite impressive both in content and construction. Among the offerings were heirloom plants and flowers. If you find yourself in the area... a stop is a worthwhile endeavor. We left Gettysburg on a rainy Sunday. drove deeper into the Appalachian Mountains. the federal arsenal by John Brown. the beautiful fall colors yet to come. better weather yet to come. Our site in the State Park. There are numerous hikes in the park. up the side of the mountain back to the campround. One of the vistas along the way. Yesterday we visited Luray Caverns. the emphasis is more on the almighty dollar vs preservation. Green Algae on the roof of the caverns is an indicator of that emphasis. Here Kate & Kristi strike a subterranean pose. A reflecting pool in the cavern. This type of formation is called Bacon. We've seen it in other caverns thousands of miles away. Stalactites as the organ pipes. We pose for a group photo over 100' below ground. Part of the Luray Caverns Complex contains an Auto Museum. had the pleasure to view. season creeping towards its peak. Thomas Jefferson outside of Charlottesville, Va.
see them plus Gracies littermate sister Lilly. The Doodles are coming so it should be a fun doggy day. The day after that we continue our trip south. during the Fall so stay tuned. We should have some real special treats in store. For a taste - here is a picture we took a few years ago along the Blue Ridge.